Do you have a car you love? Are you looking for a way to keep it in great condition? Are you tired of getting it sparkling clean on the outside, but putting up with a less than satisfactory finish on the inside? Maybe you have pets, children or hobbies that thwart your best efforts to keep your interior clean? Frustrating, isn’t it? That’s why we’ve put together this list of powerful steam cleaners that can truly get the job done and give you the inside finish you’ve been looking for. We’ve rolled up our sleeves up and in true Steamclean style, researched all the portable possibilities for you and your car. Now we know that you know about the power and efficiency of steam cleaning upholstery, but there are just so many options out there for today’s consumer who’s ready to take the plunge. It can be quite overwhelming when you first take a look. That’s why we’ve steamed into action and produced this handy list of today’s top contenders. By looking at a variety of factors including reliability, customer satisfaction and functionality, we’re certain that we’ve got your options covered. So whether you’re looking for a budget-friendly model or an auto-specific design, you can be sure to find it here. All you need to do now is pick the one that’s right for you and get steam cleaning your car’s interior until it looks as good as new. We’ve placed our top 6 into suitable categories, ranging from ‘best all around’ steam cleaner to ‘most budget friendly.’ By doing this, we’re certain you’ll find something best suited to your specific needs. By far the most popular as well as being reasonably priced, this steam cleaner ticks a lot of the right boxes for many consumers. Boasting 30% more steam than other models, it’s able to tackle tough stains in upholstery with a number of durable attachments and a fast heat up time. Customers were also pleased that it had a larger water tank than other models, meaning less refills during that all-important cleaning session. Unlike its competitors, users noticed how efficiently this cleaner stands up on its own, rather than tipping over during use. Most importantly, one truck owner commented that it removed the bad smells that had begun to linger in his truck seats, as well as removing stains from coffee spills. It’s reasonably lightweight too, so it can be used easily on the move and in awkward spaces in your car’s interior. No more advanced yoga poses for you to contend with. Despite the many positives, some users commented that the brush head on the attachment wasn’t as big as they were hoping for, so it wouldn’t cover larger areas easily. Unscrewing the cap on the steamer can also be difficult as it’s quite stiff. The attachments can be rather awkward to connect to the main hose too, so you’ll need to make sure they are securely fitted before attempting to use them. 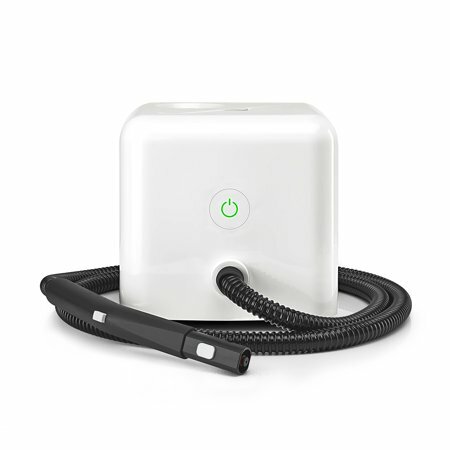 Nevertheless, we still feel that the PurSteam is the best all-around steam cleaner on the market. We love our pets and we love our cars. Sadly the two don’t often go well together. Mucky paws, muddy fur and all that saliva can add enough stains to our cars to last a lifetime – no matter how much we might scrub. Enter the Hoover Spotless Portable cleaner and those pet worries will be gone quicker than you can say ‘fetch!’ Why? Because this model features specific pet stain remover attachments, as well as shampoo that can be purchased, to really help you get rid of unwanted stains and dirt courtesy of your furry friends. It’s also popular because of its Dual Tank Technology, meaning that clean and dirty water never mix. It self-cleans too (a big plus for many customers) so that the hose is never clogged with gunk. It’s lightweight so you can use it regularly to ensure your car upholstery remains consistently clean. Some consumers noted that the spray nozzle does have quite a wide coverage, but by holding it down and directly onto the stain, this eliminated the problem. A few people had found that the hose on the cleaner broke off fairly easily after only a few uses, but Hoover had replaced them when needed. Surely it’s time to say ‘goodbye’ to those stains and ‘hello’ to a pet-tastically clean car. Most of the portable models in our list have a multi-use design – i.e. they can be used successfully in cars, but also in other areas around the house too. 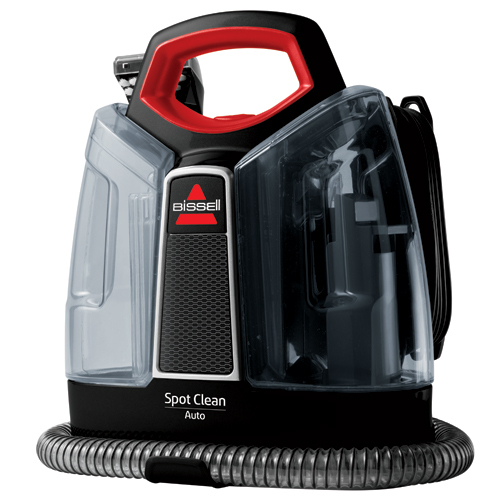 The Bissell SpotClean Auto Cleaner is designed specifically for automobiles. 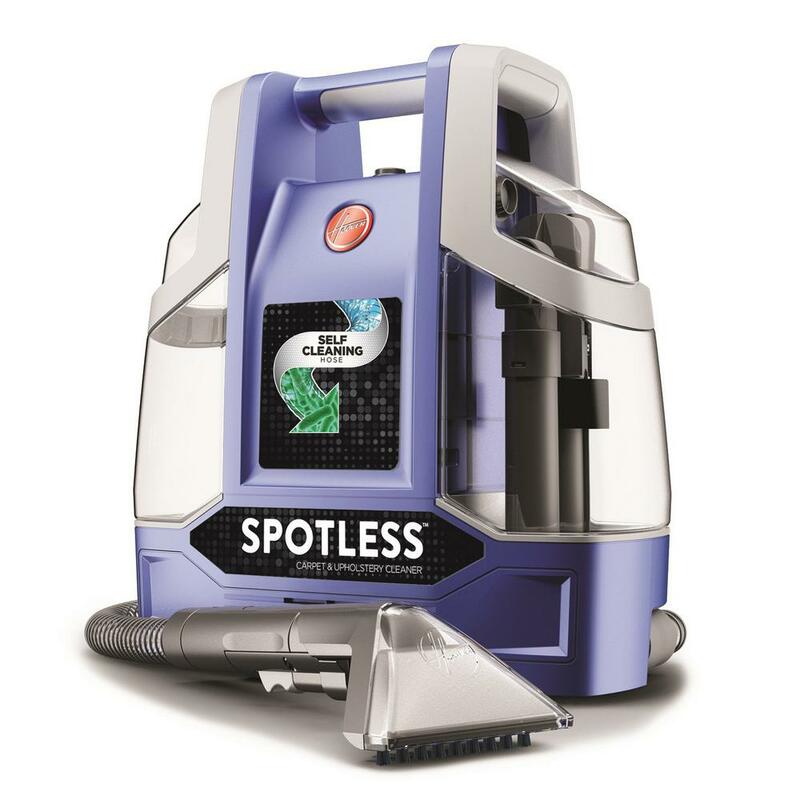 If you just want a steam cleaner for your car, rather than an all-around, multi-use model, this is the one for you. But what makes it so auto-specific? Well, the 2in1 spraying crevice allows you to not only get into hard to reach places, but also have enough steam power to tackle car mats and upholstery liners. Its specific carpet cleaning formula ensures you get rid of stains and spills from anywhere in the car, leaving a fresh smelling scent in their path. The tank is large too, so you won’t have endless trips back to the tap to refill it either and it maintains a consistent temperature throughout its usage. Consumers also liked the fact that it was easy to maneuver when cleaning inside the car and how easy it was to assemble. With a portable unit like this, you do need a good length of hose and some customers felt that the Bissell’s hose wasn’t quite long enough, particularly when getting into all corners of the car. Others found that the unit at the base of the model where the water collects can leak, thus emptying dirty water back onto the area you’ve just cleaned. A steam cleaner that’s one for the real auto-enthusiasts among you, it aims to give you that detailer finish you might be looking for. A great little machine with steam that reaches 290 degrees Fahrenheit, the AutoRight gives great value for money. It loosens and dissolves dirt easily and is really effective at removing built-in stains and spillages. It’s also very versatile, cleaning upholstery, leather, dashboards and windows with ease. 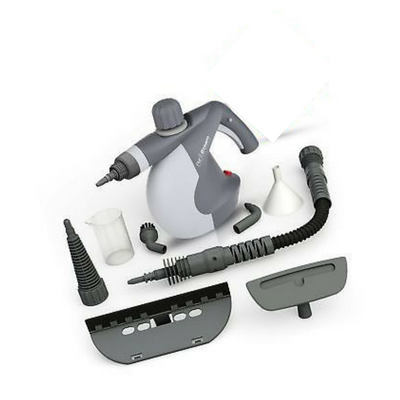 With over 11 accessories, you’ll find something to do every kind of job and with a tank that provides 45 minutes of cleaning time, you’ll be able to get a lot of cleaning done before a refill is required. Consumers particularly liked the ability to lock the trigger, preventing your hand growing tired whilst holding it down – this is not a feature found on any of the other models in our list. One auto detailer had even used it to remove grease and grime for his cars’ engines and it did a great job. A few customers found that, yet again, the accessories weren’t tough enough to sustain repeated use. It does seem to be a problem feature for quite a few of the steam cleaners we researched. Other consumers recommended moving the steamer quite quickly as you clean too, to avoid drops of water falling on your freshly cleaned interior. A budget-friendly steam cleaner that still does a good enough job. 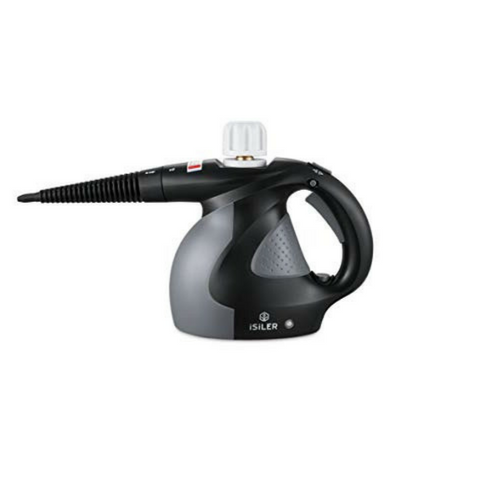 A handy steam cleaner weighing less than 3lbs and with an ergonomic handle, this model is easy to use over longer periods and provides great cleaning power. The fast heating core means that the iSiLER is ready to use in as little as three minutes. There is also a safety lock to ensure that any small fingers that want to help ‘clean the car’ are safe. It also stops you getting scalded when you’ve finished using it too. A number of consumers noted that this lightweight model shouldn’t be underestimated for its cleaning power – even on the toughest of stains. It might look cute, but it certainly packs a steam-cleaning punch. The extension cord is also a useful length (3 meters), which means you can get in and around your car with relative ease. One customer noticed that this model wasn’t able to completely remove any oily spillages, although it did help to get a lot of the stain out. As with any of these steam cleaners, some of the stains can take a fair amount of time to get out – patience is paramount. A great, lightweight model that is popular with customers and tougher than it first appears. The Dupray is a popular model as it produces great results on many different types of material and interiors. It gets rid of pet stains and odour, as well as the spillages that can only come from having small children in the back of the car. Hello sticky hands! 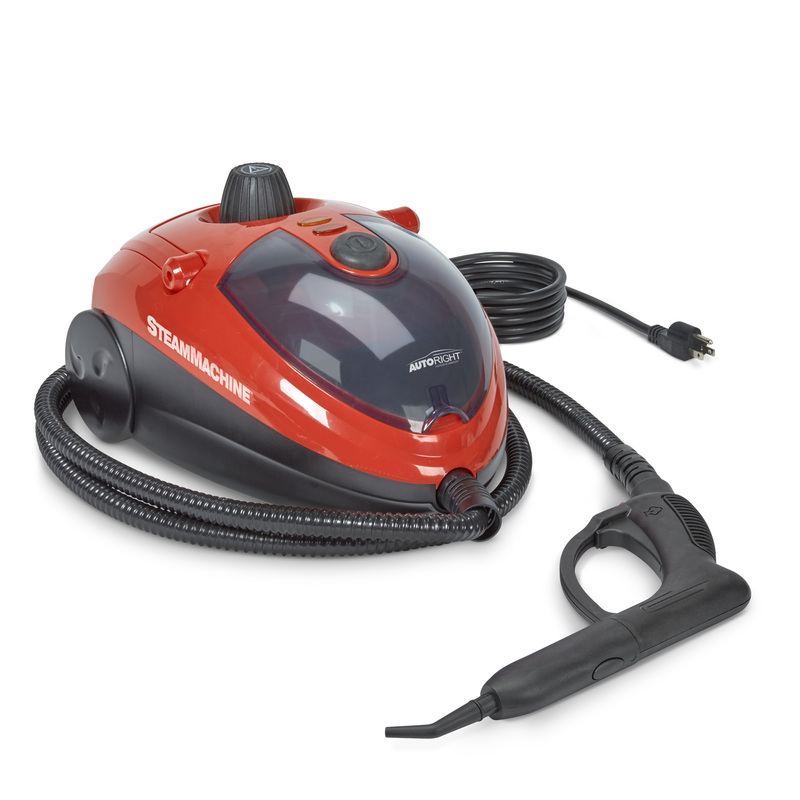 What we love most about this steam cleaner is how powerful it is and how many customers were able to sing its praises. Its tank is in a compact box with a retractable handle for easy portability and it has a 2m hose, which is perfect for all the nooks and crannies in a car. But what did customers like the most? Well it’s got 50 minutes of cleaning time in each tank which is easily enough time to get around the inside of the car and even give those alloy wheels a bit of clean up too. The funnel is built in so you won’t be worrying about spillages and mess when you do need to refill it. Consumers also commented on the impressive amounts of steam that this model produces during usage. Some were wary, however, of starting the steamer up again after a few minutes of non-use, as it does spit hot water at the very start. There is no safety feature so you might need to be mindful if you have young children or pets. A deluxe model that provides an excellent amount of steam – certainly one to consider if you’re willing to pay that little bit more. So there you have it, a comprehensive list of the best steam cleaners on the market. 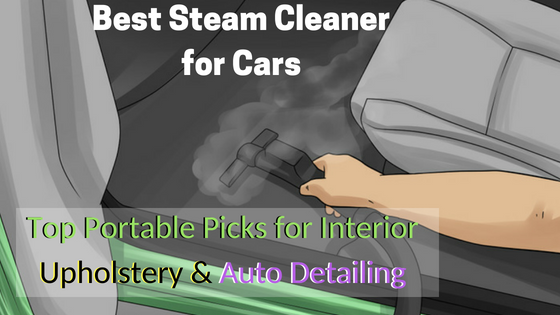 We think it gives you plenty of options to choose from to get the results you want when steam cleaning the upholstery and the detailing in your car. Although a couple of the models are specifically designed for use in cars, it is evident that the more ‘multi-purpose’ cleaners do a better job of really tackling stains and dirt. While any of the steam cleaners that we’ve recommended would be an excellent choice, for top all-round value we recommend the PurSteam Handheld Pressurized Steam Cleaner as the best car steam cleaner. Whichever choice you go for, it seems important to remember that, although steam cleaning has many perks, it can provide common problems for consumers. Taking the time to read the instructions is vital – as one consumer pointed out, he wasn’t using all the functions his cleaner had to offer, simply because he hadn’t taken the time to read the manual. 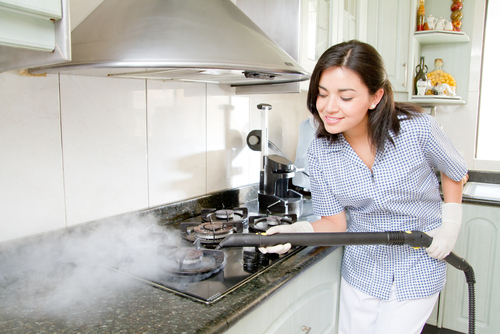 Steam cleaning also takes time and patience to get rid of really stubborn blemishes. Some customers seemed irritated to find that these sorts of stains did not come out as quickly and effortlessly as they wanted. The most positive comments about any of the steam cleaners we reviewed came from people who understood that, just like anything, a little bit of patience goes a long way. If you’re willing to put that in, you can be sure of a great result. Don’t forget to visit our homepage to find more expert reviews and recommendations covering all your steam-cleaning needs!